Leeks were the first crop Guy Watson grew on a substantial scale when he started Riverford and they remain an important staple for us throughout the winter. By April, the spring warmth has made them bright & sweet and perfect for eating. Here we pair them with an old French farmhouse larder sauce. It’s eggs and pickle base with garden herbs enhanced with one of the other joys of spring, ramsons or wild garlic. This starter brings the very best of seasonal veg to the table. This recipe is a shared starter for 6. Recipe credit: Patrick Hanna, Head Chef. Chop off leek top & ends, leaving on enough root to hold the leek together. Clean thoroughly. Save leek tops for later. 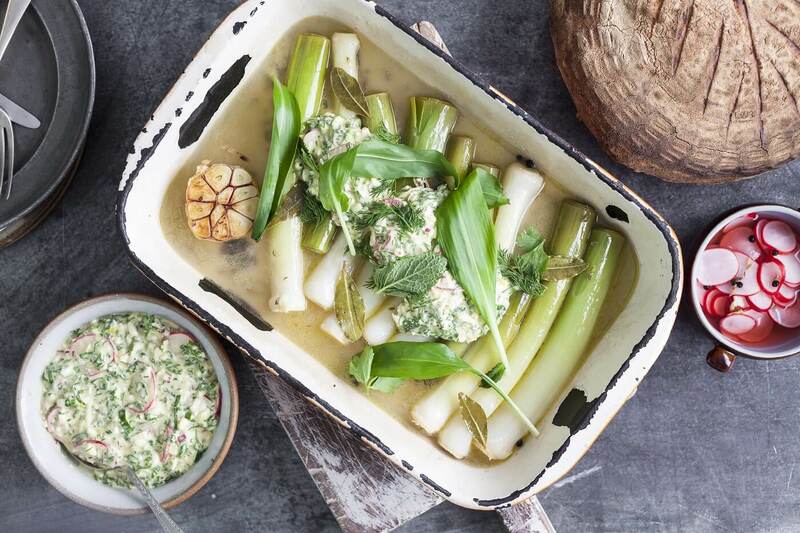 Put leeks into an oven dish with bay leaves, spices and lemon zest and pour the water and wine over the top. The leeks should be ¾ submerged. Cover with a cartouche. Tip: Poach the leeks until they are just done. You want a knife to easily pierce but the colour to remain strong. Save some of the liquid for when you are dressing your dish. Drop the eggs into a pot of boiling water and time for 7 minutes. Refresh in iced water. Fine dice the red onion, mandoline the pickled radish, and roughly chop half of the ramsons and herbs. Drain the capers. In another bowl, whisk the mustard and lemon juice together and slowly add the rapeseed oil. Tip: Do this slowly and make sure it is emulsified into a thick vinaigrette. To make burnt leek powder, wash the leek tops, tease apart and bake in an oven at 170c turning until it has deep dark oily colours, transfer to a dehydrator at 52c for 12 hrs, blitz and dehydrate for 12 hrs. Blitz and pass through a sieve. Spoon generous dollops of gribiche on top. Sprinkle a few pinches of burnt leek powder. Scatter the remaining ramsons and herbs over the top, season and make sure there is bread to mop it all up with!